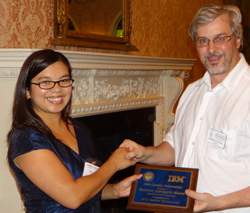 Postdoc Maricris Mayes (ALCF) received the IBM-Löwdin award for postdoctoral researchers. This is a competitive fellowship that was given at the 52nd Sanibel Symposium— an international symposium in quantum molecular sciences. The award was presented at the symposium and comes with a plaque, complimentary registration fee and up to $1000 in travel reimbursement. This entry was posted in Postdoc Awards and tagged maricris mayes. Bookmark the permalink.